Beautifully renovated 4 bed Federation cottage, modern light and bright interior, ideal inner city location in prestigious West Hobart street, flat access, off street parking, ideal for families, couples, wedding parties, groups and executive travellers. Close to shops, cafes/restaurants, 1.5km to city and 15 min drive to MONA. This gorgeous 1905 large renovated character Federation cottage is perfectly situated in the very popular inner city suburb of West Hobart. This wonderfully located, north-east facing, sun filled, large Federation weatherboard home is well situated on a flat block. Located 1.5km (25 min walk or 5 min drive) from the city centre of Hobart, the property is located in one of the best streets in Hobart, boasting extra wide footpaths and road, lined with federation cottages and bathed in all day sun. The cottage has been tastefully renovated with a fresh, light, modern feel and has everything you could need for a comfortable and enjoyable stay. 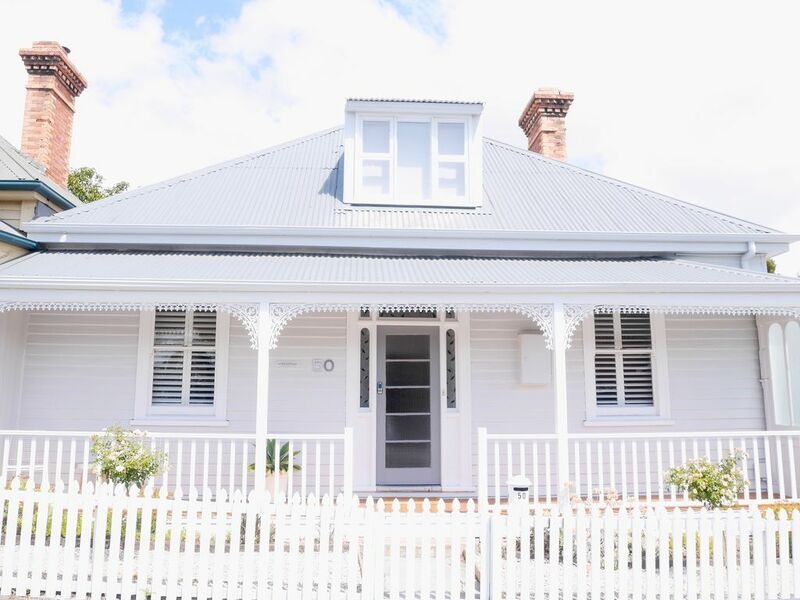 Beautiful crisp white and grey linen, clean white interior, Federation features including a stunning front veranda with original wrought iron lacework (the perfect spot to enjoy your morning cuppa), fireplaces and high ceilings. Our fully renovated cottage features off street parking, flat access, sunny backyard, gorgeous sunny veranda perfect for watching the world go by, large brand new bathroom, two toilets, separate laundry with washing machine and clothes dryer, four double bedrooms (three downstairs and one upstairs) all with wardrobes, open plan kitchen/dining/lounge with a 6-seater dining table, Bosch dishwasher, Nespresso coffee machine and complementary tea, coffee and milk. Three of the bedrooms have queen size beds, and the fourth has a double bed. One of the downstairs bedrooms has a clear glass skylight (with shutters). We recommend the early risers reserve this bedroom. The attic bedroom upstairs has lovely views, which can be enjoyed from the large window. The luxurious bathroom is the perfect place to take a bath and relax after a day of shopping or walking. The spacious, brand new bathroom has a shower over bath (full size bath). We supply guests with Basic Earth Botanicals eucalyptus and lemon myrtle body bars and shampoo and conditioner. The backyard has great all day sun, and provides you with an excellent area to entertain around the outdoor setting and BBQ. It's the ideal place to eat lunch in the sun or make the most of the long summer evenings by feasting on your award winning meat and sausages from West Hobart Gourmet Meats and fresh artisan bread, Tasmanian cheeses, fresh fruit and veg from Hill Street Grocer. The very popular John Doggett Park has recently been completely refurbished which is located directly across the road. The park has a skate bowl, huge fully fenced playground and excellent BBQ facilities and public toilets, perfect for families with children of all ages. We are family friendly and welcome young children and infants. Available upon request are a high chair, portacot, baby bath and bassinet. If you require these items, please request these items with your booking request. You will have access to the entire property including the cottage, off street parking and generous courtyard. Please note that you will have access to the number of bedrooms as requested in your booking request only. We have a convenient electronic key pad entry so you don't have to worry about keys. You will be left alone during your stay, however if you need to contact us during you stay we live in the area and are only a phone call or text away. There is a guest information book with our recommendations on where to eat and drink and things to do and see in the local area and greater Hobart. The very popular and recently upgraded John Doggett Park is directly across the road, perfect for children of all ages, with BBQ facilities. Renowned Hill Street Grocer (for all your gourmet deli, seafood, Tasmanian wines, artisan bread/bakery and fresh produce needs) is one block away, Smolt Kitchen cafe and restaurant is two blocks away (and a lovely short stroll through the historical leafy streets of West Hobart), award winning West Hobart Gourmet Meats is one block away, North Hobart restaurant, cafe and retail strip is a convenient 10 minute (600m) walk which boasts an endless array of dine in or take away food options. There is a bus stop approximately 100m from White Cottage that will take you into the centre of Hobart. A taxi into the city centre is approximately $15. We would recommend walking into the city and Hobart waterfront/Salamanca (all downhill) for some shopping and sightseeing and taking a taxi back. The North Hobart restaurant and cafe strip is an easy 7-10 min walk (600m) from White Cottage. We live in Hobart with our young family, run a small business and manage our two guest houses; White Cottage West Hobart and White Cottage North Hobart. We are born and bred Hobartians and have a vast knowledge of the very best places to eat and drink and sites to see around Hobart. We are also experienced in managing visitor accommodation and have travelled extensively within Australia and oversees. We love making our guest experience a cut above the rest! Beautifully restored 1915 spacious cottage, light and bright, off street parking, central to loads of cafés/restaurants, Salamanca, Hobart city and MONA, yet situated in a quiet street. Located directly across the road from a great children's park. Toilet, full size bath, shower over bath, hairdryer, towels and face washers supplied, fully renovated. Separate laundry with second toilet, washing machine and clothes dryer. Superb location for families, well looked after property with all the facilities you need (heating, electric blankets for cold nights!). Safe and quiet street, beautiful modern bathroom and comfortable bedding. We had a great stay. We found White Cottage comfortable, quiet and spacious. Decor is appealing. The location cannot be faulted - many restaurants and cafes are nearby while the city and the waterfront are just a few minutes drive. Thank you for your lovely feedback David. We would love to have you and your family stay at White Cottage West Hobart in future.